Pantodapoi are not particularly reliable soldiers, but they can give a good account of themselves in battle if deployed properly. They wear no armor, and have only a light shield for protection allowing them to fend off light cavalry for a time, if need be. The most basic and numerous of the infantry units used by the non-European Successor States were the Pantodapoi infantry. These men were called from a variety of nationalities and were usually settled in certain areas for garrison duties and the like. There were Ioudaioi, Syrioi, Kilikes, Persai, Assurioi, Aigyptioi and many other peoples counted among their number. They are not particularly reliable soldiers, but they are certainly better than their eastern counterparts. They can give a good account of themselves in battle if deployed properly. They wear no armor, and have only a light shield for protection, so most other infantry will slaughter them in droves. They can fend off light cavalry for a time, if need be. 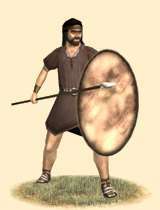 Historically, the Pantodapoi were a group of various nationalities that were used as a militia levy and defensive group for towns and villages prone to raiding. While the name is conceptual (meaning, from everywhere), they were a standard fighting force of the day. They were trained rudimentarily, but had enough training to be counted as superior to many militia levies. They had some experience fighting off nomadic raiders, so they can be useful against light troops and some light cavalry.